As bad as I am with my lipstick hoarding (I.want.them.all), I am the same when it comes to foundations. I want, need, MUST HAVE every single sheer to medium coverage, dewy finish base that is available in the market. I do stay far away from matte and full coverage as I personally feel it makes my face look cakey and plastic. Thanks to Target liquidation sale, I managed to dive head first to a newly discovered (for me!) Canadian brand, Annabelle. One of the products (I picked up quite a few) that I bought was Annabelle SKINTRUE Natural Lightweight Makeup. There was no tester available so I took a chance in picking up the shade Medium Beige as that is normally my shade and thank goodness, it perfectly matched my skin tone. Every time I apply foundation I use the same amount as you see in the last picture. I dot a small blob on my forehead and each side of my cheeks and blend it outwards towards my hairline. I learned the technique from watching Lisa Eldridge's videos and it gives the best finish on my skin. This foundation comes in a plastic squeeze tube and is everything that it claimed, it's lightweight, sheer but build-able to medium coverage and the part I love most, looks like skin. I didn't notice any transfer while carrying little tyke, there was no brownish, yellowish stain on his white clothes. If you have kids, you'll know what a bloody pain in the arse it is to remove makeup from children's white clothes, actually scratch that, make it any sort of white clothes. 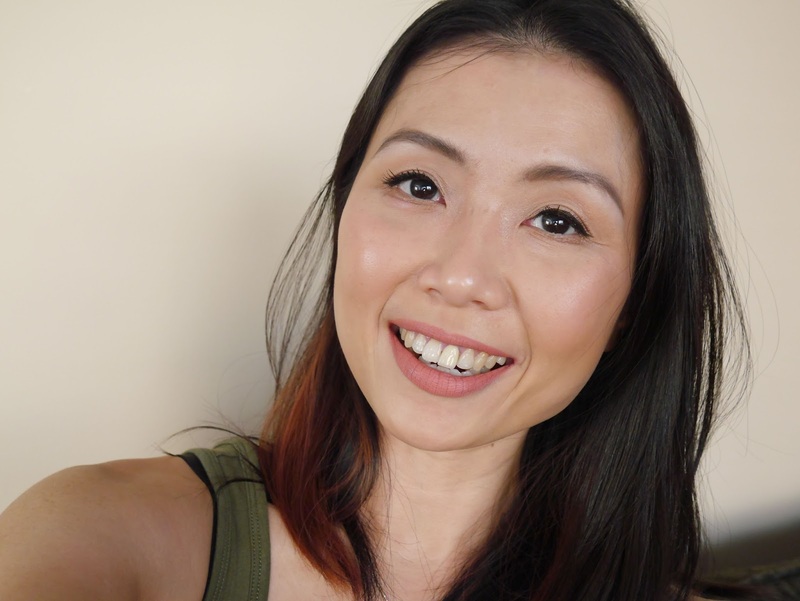 If you need a full coverage base then do yourself a favour and skip this but if you're a sheer - medium coverage and natural looking foundation lover like me then you will absolutely adore this! I really have to stop claiming I have found my HG! foundation because every time I find one, I will soon discover another that blows me away. Overall, I am seriously pleased with my first introduction to Annabelle and it is products like this that convince me to not spend tons of money on high end makeup. I personally believe that there are many drugstore products that are as good as high ends. Annabelle SKINTRUE Natural Lightweight Makeup is retailing for CAD10.95. What is your favourite drugstore foundation? Do you love sheer or full coverage base? Do share!